Dancing eyes-Dancing feet Syndrome is medically better known as the Opsoclonus-myoclonus syndrome (OMS). 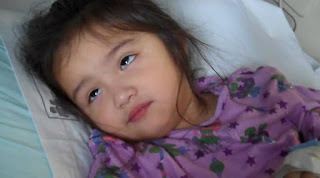 It is a rare neurologic disorder characterized by rapid, multi-directional eye movements (opsoclonus), sudden muscle contractions (myoclonic jerks), uncoordinated movement (ataxia), irritability and sleep disturbance. The onset is usually abrupt, often severe and can become chronic. Dancing eyes-Dancing feet Syndrome typically occurs in association with tumors (neuroblastomas) or following a viral infection. Relapses are common and may occur without warning. Signs and symptoms of Dancing eyes-Dancing feet Syndrome may include [a] an unsteady and trembling gait, [b] sudden, brief, shock-like muscle spasms (myoclonus) and [c] irregular, rapid eye movements (opsoclonus). Muscle spasms occur most when trying to move and worsens with agitation or stimulation, but can also be present at rest. An affected person may appear tremulous, or have jerking movements. The face, eyelids, limbs, fingers, head and trunk may be involved. During the peak of the illness, sitting or standing is difficult or even impossible. Other symptoms may include difficulty speaking; poorly articulated speech or an inability to speak; difficulty eating or sleeping; excessive drooling; incoordination; rage attacks; head tilt; a decrease in muscle tone; malaise; and/or other abnormalities. Children may appear to be nervous, irritable or lethargic while adults may have mental clouding (encephalopathy). Recently this syndrome has been linked to infections with Dengue Virus, Zika Virus, West Nile Virus and Influenza A Virus.